I’ve been thinking about dying a lot lately. Not my physical death, which I have little control over, but the spiritual one. We love words like Resurrection and Regeneration but Jesus talks about the death part a lot and we just kind of nod and change the subject. It’s one of those things that sounds okay on a philosophical level, like helping the poor, but we’d rather write a check than sit in their living rooms. Peter passionately blurted out that he would follow Jesus, “even unto death”. But then a few pages over, we are surprised to find him ashamed of even knowing Jesus, and irritated by the annoying questions circulating about him. “I’ve never heard of the man!” Peter hadn’t really given this type of death much consideration. And to be fair, like our real death, you can’t know it until you are stepping into it. We are made to resist this. It’s called humility. Lately my husband and I have been knocking on doors. But most of the doors have the screens punched out, the hinges busted; sometimes the steps are treacherous. Standing face to face with someone who lives behind these doors is refreshing because usually the ground is leveled. We are sinners. All of us, and that fact is hard to argue when life has obviously taken a wrong turn. Sometimes it’s just a bad deal; abuse, growing up believing you will fail, isolation. It makes you poor – not just ending up in a cruddy apartment complex where grass never grows on the dirt patch outside your broken steps but inside; in spirit, in hope. I remember many years ago, living in a tiny house in Orleans. There were five of us in a two bedroom cottage and I ended up sleeping out on the uninsulated porch with a propane burner. I never felt poor or embarrassed. But one day my son had a friend over to play, a friend that came from a beautiful neighborhood where his parents had bought a large colonial for their family of four. I was trying to teach my kids about giving and in this great spirit, Miles joyfully gave Steven a brand new box of matchbox cars that had just been given to him. It was a sacrifice and I watched Miles’ heart lighten as his little friend, face aglow, beheld the shiny new box. When Steven’s dad came to pick him up, he ran to him shouting with joy. “Give it back!” He was shaking. We were all stunned, and I watched bewilderment cover Miles’ little face. “Give it back now Steven and let’s GO!!! His dad was sputtering and would only look at the shiny box. The snow is melting; not fast enough for any of us that have weathered the endless storms and endured the unbroken white or dirty gray landscape for the last two months but it will melt and spring will arrive (Thursday as a matter of fact) signaling new life. I like that Easter is placed right in the midst of it all. And I think its good that in the midst of lilies and colored eggs and jellybeans is a plain wooden cross that you can’t cover or change. It’s there and in its shadow we are sinners, our hearts all busted and corroded just like the doors my husband and I knock on. We are caught in the midst of our lives by this unavoidable paradigm. There must be death before there is a new life. You can redo your old life on your own terms and probably still look good but you will never know resurrection life and the amazing power behind it unless you stand alone, before this bloody cross and surrender. Repentance is one of the most mysterious gifts God has left us. There are no deals, no part-ways in. It’s all or nothing. As we lay down every little thing that we think we can’t make it without, we enter into His death. And as we emerge from this death, we are changed. We are not a better citizen or some type of hyper super-Christian. We are humbled. And in this beautiful posture we find we are joined to Christ, in death and in resurrection. This is what made Paul, who had more prestige and power to boast of than anyone of his day, state plainly: “I count all things loss…that I may know Him and the power of His resurrection.” All things. I struggle in this place and honestly; my pride totally blinds me sometimes. God is quick to point it out when I ask him, and it’s unpleasant at best to see the dark selfishness of my soul. But there is always room at the cross. I was surprised to learn that the suicide rate is highest in the spring. Psychiatrists theorize it is a physiological response to longer days or a warmer climate but I think some folks are just too worn out to dress up the old self one more time. I remember resenting spring after my son died. I didn’t want things growing and changing. I was too tired to move forward. But there is a better death, that leads to a hidden path winding upwards, towards God’s glory, towards a whole new life, free from self and full of a joy that is unspeakable. There must a death before a resurrection. Come to His old rugged cross. He is there, as we repent, to lead us to life; abundant, overflowing and everlasting. **** This is a beautiful version of a favorite old hymn. I lay in the dark and tried to locate my two granddaughters by their breathing. Brooklynn, age five, had a slower, softer and more rhythmic breath. Olive, at three, had a little bear-cub growl on inspiration and I could tell she was right below me on the floor. I smiled remembering a few days ago when all three of us shared a futon and Olive seemed drawn to my left ear all night. Not much sleep. Not much sleep this night either. The birds began the dawn chorus as the room took form around me. My eyes locked onto their beautiful faces. Brooklynn had informed me this trip that she would be a teenager someday. Amusement mixed with sorrow tugged at my heart. The plane leaves at 1:07 and in my usual neurotic manner I watch the clock, pacing, trying to enjoy my last few hours with my family, but I can’t. It’s time to go. Why prolong this? I request BoJangles as my last meal on hallowed Dixie ground and we stop, filling our mouths with greasy biscuits and Bo Round potatoes and swishing it down with iced tea. The biscuit is like Prozac. I kiss everyone goodbye and roll into the small airport. Brooklynn and Olive told me they were sad I was leaving, a genuine but child-like sorrow that most likely would dissipate about 5 minutes after I leave the car. I love the simplicity of a small child’s emotions. Sad, mad, glad. Sometimes bad. I wish my own palette of feelings could stay so pure and discernible, like a Dr. Seuss book. I think this is one of the things God had in mind when He matched me up with my husband, because C.B. has very delineated paths of thought and emotion: straight, sometimes intersecting with a vertical response but easy to recognize and sort out. When I get overwhelmed I become gridlocked like lunch hour traffic in midtown Manhattan. I had to tell God I was sorry as I sat outside the hospital in the dark, trying to pray, and realizing that I had totally blown off prayer the day before. My husband had cleaned the house and he even had fed the birds for me. But I had behaved like a sullen adolescent, withdrawn and self-absorbed. I thought about the lady with the shopping cart in the airport and I knew that God put her there for me, not just so I could help her but because she would end up helping me. I blew it. I cried over the ironing board. It tied indirectly into running out of pancake mix, which wasn’t my fault. I took Rosie around the pond at sunrise and asked God, What’s the point here? I feel like I should have an assignment if He insists on keeping me here, on earth, in New England, on Cape Cod where the north wind across the ocean feels like ice is being poured down your shirt. He gave me no answer. He was perhaps waiting for an attitude adjustment. My husband noticed me ironing and weeping and asked what was wrong, and I repeated my conversation with God. I had no answers. He came over and pushed the ironing board to the side and put his arms around me. “All I know is that I love Jesus,” I sobbed. “And that’s all you need. “ he said. Here is the answer; here is the point of it all. Terrible and beautiful in all of its mystery and power, it is the place of unfathomable pain and agony, yet immeasurable comfort and peace. I stood alone in its shadow, obscured by it. Take up your cross and follow me. How can I bear the weight of it? I step into the light, and every stain of my selfishness is exposed, yet a greater measure of mercy and grace flows from above, covering my shame, turning my sorrow to joy. I am home, in Him and He is in me. My yoke is easy, my burden is light. We turn to leave. I’ve never read One Thousand Gifts and I doubt I will. It sounds too exhausting, one more impossible bar to measure up to. I’m not thankful for everything, and sometimes I’m just grumpy about being here. Nor do I find God in all things. Isn’t that panentheism? Yet in all things He is there with me. Sometimes I wander off, like a child at a carnival. But I know the way home, and hungry, thirsty, dirty, He takes me back, fills me and lifts me high upon a rock, where I can see eternity in the distance. Then I need no explanation or plan. Sad. Mad, Glad. 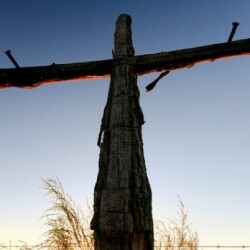 Thank you Jesus for leading me back to where we sometimes must begin again…at the cross. And whom I love in return. CB was right. It is all I need. 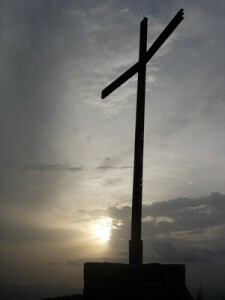 The Cross or What’s So Good About Good Friday? March is beautiful somewhere. But not here. I’ve always been a big defender of the month nobody loves because I was born right near the end of it. Hence the name, Robin, as in “first sign of spring”, although with global warming the robins have become confused and disoriented, showing up in January with beach chairs. Also, on my 36th birthday I received my best birthday present ever, my little Jake the Giant, born eight minutes after midnight. So we rally during March in my family. It’s a month of great promise if you choose to look at it that way. They say March comes in like a lion and goes out like a lamb. I’m looking out my window right now and it’s downright dismal. It’s like it can’t decide whether to act like winter or spring so it’s “sprinter”; a soggy, slushy mess thrown in your face at 40 MPH. 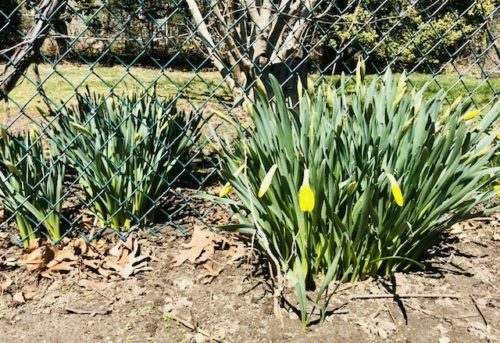 There are daffodils out there, behind the fence, under the slush, shivering their little frail stems off. It’s a brutal month, coming in more like a rabid dog this year than a lion. Yet it could be 60 tomorrow, evaporating memories of today, and we would all be at Home Depot buying seed starter kits and lawn fertilizer. We are wired to hope. Teens will be crowding around basketball hoops with their shirts off and a few motorcycles will blast down the street. The daffodils will shake it off and push upward. This March is a hideous commercial event with Easter and Saint Patrick’s Day sharing the shelves, only two weeks apart. Leprechauns leaning on bunnies and shamrocks in the jelly beans. Not just the robins are confused! I wonder if Jesus and Patrick find it amusing or terribly sad. Religious folks prepare by putting dirt on their foreheads and giving up Dunkin Donuts for a month. Parents are required to fork out gifts for their kids, along with the overstuffed Easter basket because the kid next door got a Wii last year for Easter. Corned beef and ham dinners raise the American blood pressure even higher. My mom used to boast that I was born on Maundy Thursday, which I thought for years was “Monday-Thursday”, like it took four days. As I grew, I realized I was born on the day celebrating the Last Supper, which preceded Good Friday, the day they crucified Jesus. I didn’t understand why either of these days were celebrated or called Good. My mom baked hot cross buns as if that explained everything. The older I get, the more terrifying and beautiful the cross becomes. And consequently, the more triumphant and glorious Easter Sunday is. The power of His resurrection should fuel every moment of every Christian’s life. Jesus IS risen, the stone is rolled away, defeating death, tearing the veil that separated us from perfect love, freedom, and life eternal. It is the most astounding act recorded on earth, too marvelous for words. Yet the cross still haunts me because it is where humanity collided with God and it is messy and mysterious and unfathomable in suffering. The same shame that Jesus bore for me, where He was broken and his blood poured out for me has become my escape to joy unspeakable. I shake my head in disbelief, staggered by this love. I like that Easter is in March this year, and I like that my birthday (and yours, Jake) falls on Good Friday. I can celebrate my entry into this world fifty seven years ago, my parents filled with wistful dreams and fragile love for their first little girl. Thirty years later, God led a broken, dirty woman to the foot of Calvary’s cross. There I was born again. March will usher in April. Strange how God determines that the death of things would bring new life. Creation is proving it right outside my window. My son, Spence had clipped these words from a page to “Calvary Road” by Roy Hession and tacked them to his dresser, right beside his pillow. When we put pride to death, God imparts power and implants hope. We rise renewed. But when we revert to our self-sufficient ways, the Spirit presses in. And so we must return to the cross, mortifying the martyr in us, destroying the self-display. As we hold fast to the cross, God offers the spirit of humility. Stray from the cross and humility recedes, pride returns. It is simple; it’s the cross. Again I say the cross. I didn’t say it was easy, just simple. There are days that I’m uncertain of why I am here, darkness descends into a private pain that is shared only with God and my heart is restless. It is then that I turn to the cross, and my darkness is swallowed up in its shadow. Jesus no longer hangs there, there are no crowds; it is silent. But I am reminded of what love truly means. In the midst of his exquisite pain, forgiveness was granted and even his mom was taken care of. I don’t have to stay there, but I can return there and remember who I am without it, that His grace still flows from it, and covers me. This is the Jesus I can never understand or explain. This is the Jesus I will follow all of my days…until death brings again, new life.